Ultimately, there is plenty to love about the Sony XZ Premium, especially if you're a Sony fan and you're into that flat-slab design. It's a flagship device with some great features, some of which can't be found elsewhere, but in the current fabulous smartphone world, it's sadly just not quite as exciting as its competition. The Sony Xperia XZ Premium sits at the top of the huge portfolio of Sony smartphones, pulling together advanced camera and display technology from other aspects of Sony's business and pairing it all with the top-of-the-line Qualcomm Snapdragon 835 chipset. However, despite touting an ultra high-res 4K screen, the XZ Premium doesn't break any new design boundaries like the Samsung Galaxy S8 and LG G6 do with their innovative screens and more up-to-date visuals. Can the XZ Premium's mighty specs make up for a lack of imagination in the looks department? The Sony Xperia XZ Premium is the best you'll get from the Xperia range. As the name suggests, it has premium finish that surpasses the likes of the Xperia XZ and Xperia XZs with its mirrored body. The XZ Premium is available in Luminous Chrome, Deepsea Black and Bronze Pink, and although they pick up fingerprints like they are going out of fashion, the glossy look is fabulous. The Deepsea Black was our review device, which is the subtler looking of the available finishes, featuring elements of blue like the Xperia XZ for a striking and deeper finish than meets the eye. Sticking true to the Sony smartphone legacy, the Xperia XZ Premium has that OmniBalance flat-slab design we've come to expect, although its finish is more seamless and slimmer (at 7.9mm) than its less premium sibling. Rather than several different materials joined together, resulting in a somewhat messy design, the Xperia XZ Premium has one sheet of 2.5D Corning Gorilla Glass on the rear and another on the front, creating a finish that is significantly less fussy. The edges remain flat with a slight curve, a feature that was introduced on the Xperia Z5, but the 2.5D curved glass makes everything look more considered - as does the reduction in thickness, even if neither help to show Sony moving as far along with its design as its competitors. Those large bezels above and below the display remain, resulting in a device that feels much wider and bulkier than other devices in the market, like the Samsung Galaxy S8 and S8+, both of which have larger displays but narrower bodies than the XZ Premium. It's a trait all the Xperia devices feature and although it distinguishes them, we would have liked Sony to reduce them as the XZ Premium's display deserves to be more prominent in the design. The wider and weightier body also mean the XZ Premium is not a device that can be easily used one-handed, requiring some getting used to, especially for those with smaller hands. That said, if you like a large device, the XZ Premium certainly feels solid and you won't misplace it easily, nor will it go unnoticed in your pocket. Pros and cons. As Sony fans will expect, the signature side-mounted fingerprint sensor is present within the power button on the side the Xperia XZ Premium, with the camera launcher button positioned a little further down. The fingerprint sensor isn't the quickest on the market and it doesn't like it if you place your finger there too quickly. It's responsive enough and we didn't have many issues with it, except for when our hands were wet, which is the case for any fingerprint sensors. A 3.5mm headphone jack sits to the right at the top of the device, while USB Type-C is centralised at the bottom. There is a microSD and SIM slot on the left of the device beneath a flap, ensuring IP65 and IP68 waterproofing. Although Sony is no longer alone in offering waterproof smartphones, it works brilliantly and it's a fantastic feature to have on board. We took the XZ Premium into the sea and a swimming pool with us to test out the brilliant super slow-mo video feature, which we will talk about in a minute, and had no issues at all. 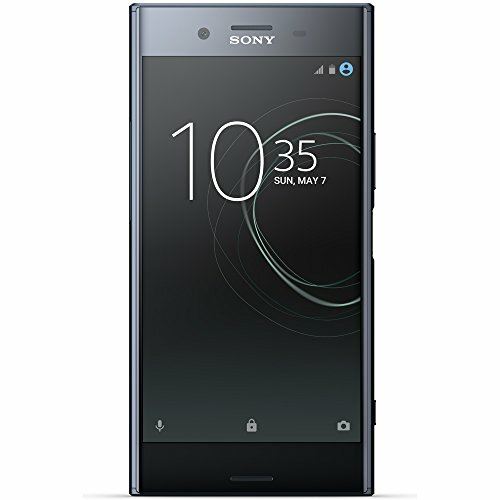 The Sony Xperia XZ Premium features a 5.5-inch display with a 4K resolution, following in the footsteps of the Xperia Z5 Premium. Sony has taken the trend for HDR (high dynamic range), an ultra-bright and expanded colour delivery technology, as found in the latest compatible televisions. With the right source content that will mean richer and more vibrant colours with better contrast and more light-to-dark detail. It's not the first time we've seen HDR on a mobile device, as Samsung introduced it on the Galaxy Note 7's 2K display, while the Galaxy S8 and LG G6 also offer it. However, it is the first time to be used with a 4K resolution on a mobile device. Sony has said it will be collaborating with Amazon Prime Video, just like Samsung will, in order to offer access to content that will take full advantage of the display technology. Right now, however, that content is not yet available. The XZ Premium's IPS LCD panel is lovely to look at, delivering rich and vibrant colours, deep blacks and white whites. We put it next to Google's Pixel XL, as well as Apple's iPhone 7 and it stands its own against both. We'd even go to say it was more impressive on full brightness and in Super Vivid mode than the Pixel XL. It is possible to select between three settings for colour gamut and contrast, comprising Professional Mode, Standard Mode and Super-Vivid Mode. The last of these was our preference for the extra punch, although the Professional Mode was better when looking at images which appear brighter on this device than they will on, say, a laptop or computer monitor. It's when watching native 4K content that the XZ Premium really shines. We watched several 4K clips on YouTube and the detail was fantastic. Those large bezels either side of the display come in useful here too as they provide somewhere for you to put your thumbs when holding the device to watch Netflix or YouTube, or play Real Racing, so they aren't all bad. The XZ Premium doesn't cope all that well in bright sunlight though. In fact, it's very difficult to see the display when in super bright conditions despite the brightness emitted from the screen itself. Not a constant problem, but something to bear in mind. The Sony Xperia XZ Premium introduces a new camera to the Xperia party, cementing its position as a flagship handset. It's called Motion Eye and Sony claims it is the first memory-stacked sensor, which is supposed to result in faster scanning. There is a 19-megapixel resolution sensor to the rear, which although is a slightly lower resolution than the Xperia XZ and previous flagship Xperia devices, offers 19 per cent larger pixels (at 1.22µm). There is also a new G lens, designed for greater clarity. To the front is a 13-megapixel camera. Overall, the results are great in good conditions. But aren't all flagship smartphone cameras these days? Give them a bright day and a blue sky and most will nail the shot. We wouldn't say the Xperia XZ Premium has the most impressive camera on the market, but it captures plenty of detail, represents colour well and it's quick to focus too, even if some shots came out a little overexposed. Sony has the hardware (most competitor cameras source Sony sensors for their camera setups) but it still doesn't seem to have nailed the processing side of things, getting a little over-excited at times. Some detail, such as background trees, get a bit fuzzy - especially when you zoom in to the image, often looking like a painting rather than a photo. It doesn't fare too badly in low-light, offering good bright images from the rear snapper, though we didn't find the selfie camera particularly good in low-light conditions - especially with the lack of front flash. In Superior Automatic mode, the rear camera won't take full 19-megapixel resolution pictures unless you specifically adjust the settings, but you get around 12-megapixels for a single image, which is more than substantial enough. There is also a manual mode, allowing adjustments to shutter speed, exposure compensation, focus and white balance. However, the ISO sensitivity control is placed elsewhere, along with HDR (high dynamic range), making things more fiddly than they need to be. Video resolution is also in a separate settings menu when in video mode, meaning you will have to dig for 4K unless you know where to look off the bat, meaning Full HD videos are the default standard. The most exciting new feature is the super slow-motion functionality of the main camera, which is easily accessible unlike some of the other features. It's by far our favourite thing about this Sony device and would be the main reason we'd consider buying this phone. Most smartphones offer 240fps slow motion, but the camera on the Xperia XZ Premium offers 960fps, which results in some really great footage when timed right with great stabilisation. However, slow-mo resolution is a little low at 720p and it crops the frame for a zoomed-in view when in mode is active, which requires you to stand a little further back sometimes. Still, it's very easy to capture the right moment and we absolutely loved using this feature. The Sony Xperia XZ Premium runs Qualcomm's Snapdragon 835 chip, coupled with 4GB of RAM. That means there is plenty of power and it typically performs just as well as you would expect of a flagship. However, there were times when the phone couldn't quite keep up with our typing, or took a couple of seconds for images to render properly in the Sony Album app. Such lag was unexpected considering the specification, but was rare - as most other times it was as smooth as a baby's derrière. Things heated up a lot when in direct sunlight though. We were on holiday and, even when hiding the device under a towel, experienced device overheating issues twice. The rear of the XZ Premium also got a little warm when playing high-end games, such as Real Racing 3, or using the AR effects in the camera, but this was less serious and not too different to what you'll get from most devices. In terms of battery performance, the XZ Premium impressed us. The 3,230mAh capacity cell more than got us through a day, from 08:30 to beyond midnight each day without needing to top it up. That included many times using the super slow-mo camera feature throughout the day, capturing numerous images, playing games and performing general tasks. Should you need additional longevity, however, then Stamina Mode will limit the processing power for greater life, while Quick Charge 3.0 means speedy top-ups at the plug. Over the years Sony has stripped back some of its bloatware, resulting in a much cleaner and more streamlined software experience. There are still several Sony apps, however, including Album, Video and Music on top of the standard Android software - but you don't have to get involved with them if you don't want. We didn't find the What's New, Sony Email or Album apps were for us. Especially the last of those, which didn't work seamlessly for sliding through videos and it also had a few issues rendering images promptly. Overall, however, the XZ Premium offers a smooth software experience. The launcher is nice, offering useful app suggestions and bringing the most used apps to the top, so there's really not much to complain about. Sony also offers support for Hi-Res Audio, which is great given this is predominately a smartphone designed for entertainment. The XZ Premium's standalone speakers could be better, but connect the device to a pair of decent headphones and you'll get a great high-end experience. On the upside, the XZ Premium delivers a fantastic display that's perfect for entertainment, the super slow-motion camera feature is exceptionally cool, the battery life is worthy of a pat on the back, waterproofing very handy, and the overall performance is great for the most part. The big letdown is that the design is lacklustre compared to other flagship devices, despite the lovely glossy coloured glass finish. The main camera also isn't quite as good in our view. Ultimately, there is plenty to love about the Sony XZ Premium, especially if you're a Sony fan and into that flat-slab design. It's a flagship device with some great features, some of which can't be found elsewhere, but in the current smartphone world it's just not quite as exciting as its competition. The Samsung Galaxy S8 is the flagship to rule all flagships. From a design perspective it's an unbridled head-turner, delivering design that's a step above any of the competition out there. Its display is excellent, as is its camera experience and the software has been reworked to be super battery conscious. The rear-mounted fingerprint sensor is a little misplaced and not overly responsive but in short, the Galaxy S8 is a masterpiece. The Samsung Galaxy S8+ is the larger sibling to the S8 with a 6.2-inch display, but it is still narrower than the Sony XZ Premium, making one-handed operation more manageable thanks to the display's 18.5:9 ratio. It offers an exquisite design, great camera, high-quality waterproof build and top-class performance. If you're after a big-screen device, the S8+ is a fantastic option, even if it is expensive. First off the mark with this new taller aspect display was the LG G6. It pipped Samsung to the post in announcing, but the devices all hit shelves around the same time and are all now available. The Samsung is more fully featured and more powerful, but it's also more expensive. LG brings its innovative dual camera to the party and also promises Dolby Vision content from its HDR display.